Besides the routine exhibitions that begin around August each year, the Visual Arts Council (VAC) seems to have outdone themselves with an exciting list of solo shows scheduled for the Henry Tayali Gallery in the Lusaka show grounds. First on the list is Kingsley Kapobe whose Whispering Colours opens next week, on Friday 27 February at 17:30hrs, followed by former VAC Vice-Chairman Zenzele Chulu in March, Lombe Nsama in April, Dean Nsabashi in May, Vincentio Phiri in June and Alexander Chongo in July, however filler exhibitions will be mounted in-between months to give viewers an extra feel of variety. Giving a hint on Thursday’s exhibition, Kapobe, 40, says viewers should expect to see a whole new range of work, nothing like what he showed during his first solo at the Alliance Francaise, Lusaka in 2011 and although he is a wood sculptor, often creating his signature chains from a single log, he will not be showing any in this particular event. “I think I have been quiet, as you may know my last solo was about three years ago, in between I have only been exhibiting in group shows. Putting up your own show is not easy but this time it was made possible by a few commissions I had done for a Mrs Tembo, Mrs Mwale and Mrs Chiwala, all the money they gave me I have pumped into sponsoring this event,” says the Luanshya born potter turned painter. Growing up in a small mining town, he says he never thought that one day he will be capable of showing his art to an audience within the capital or beyond, he believes his aspirations are unfolding. He then applied for a residency at the Art Academy without Walls (AAWW) in the Lusaka Show grounds in 2009 at the time he had already began finding a foot hold as an art administrator rising to the position of VAC Copperbelt Chairman. 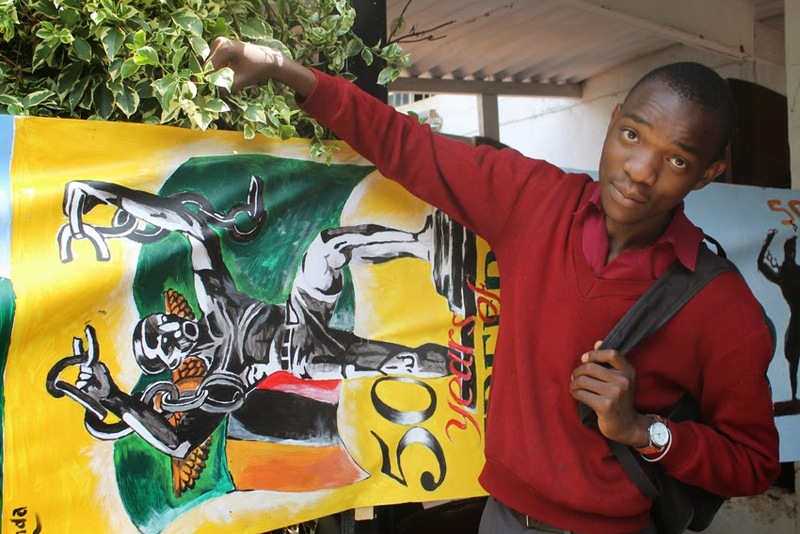 He later applied for the Insakartists International Workshop in 2010 this would take him to Livingstone where he was further inspired by local and foreign artists in attendance at the No Name Camp. “Since my days at Moore Pottery I haven’t really had time to practice ceramics, but I haven’t abandoned it altogether, it’s just that ceramics studios have costly equipment and materials so I had to adapt to painting” he says “But the painting for me really started in my second year of college, I used to frequent a place where the art lecturers at former Africa Literature Centre (ALC), Emmanuel Nsama and a Mr Chisha would operate from, so I started buying small paints and we would also go to Mr Nsama's place in Chimwemwe where I continued practicing with his help and then when I came to Lusaka I worked with Mr Emmanuel Kalombo Mbondo a Congolese whose brother was also a lecturer at the ALC, he is now based in South Africa. After its Thursday opening, Kapobe’s Whispering Colours will be on display for two weeks before it makes way for the next artists work and as the title indicates viewers will be in for a vibrant treat, the artists palate does not only radiate a delicate blend of colours, but his paintings also display a unique mastery of the pallet knife which he uses in preference over brush. 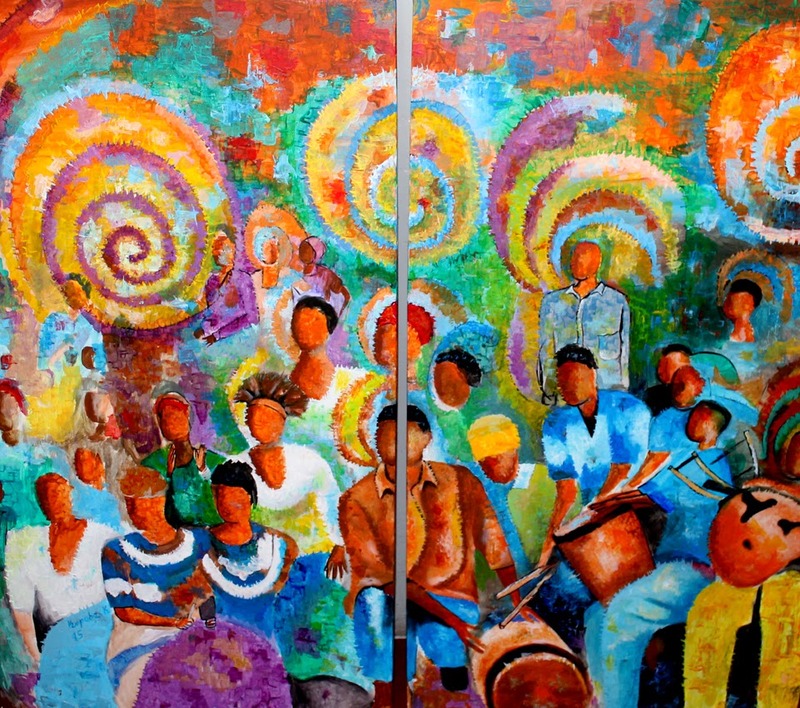 The group shows scheduled for the Henry Tayali Gallery this year are the annual Showtime exhibition, held during the agriculture and commercial show followed by a trio, Adrian Ngoma and friends in August, the Augustudio (Young/Upcoming artists) in September, the National/Independence Day exhibition in October, The Best of Lusaka in November and finally the Christmas Exhibition which closes the year in December. 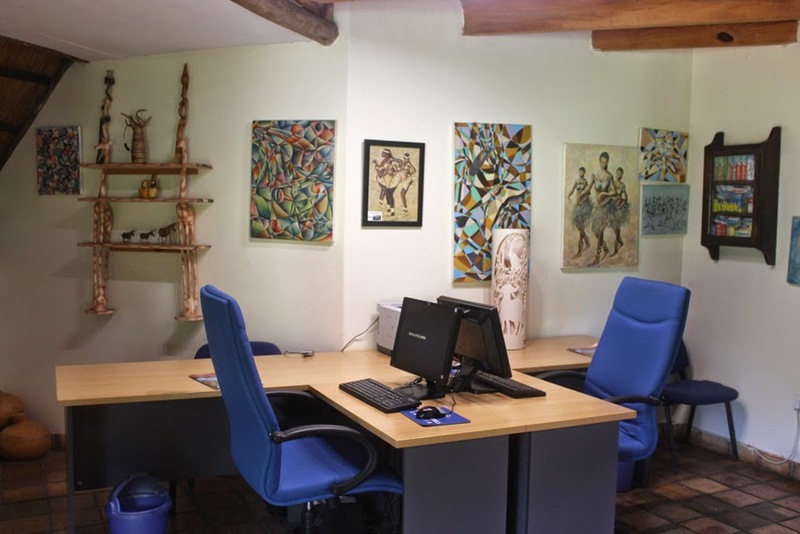 Protea Hotel Safari Lodge, Chisamba, located 35 minutes from Lusaka city centre has over the years become a favourite for corporate workshops and seminars due to its tranquil environment away from the hustle, bustle, and unbearable traffic of the capital. Surely, one of the hotels specialities is its famed buffets served under the ambience of a large thatched dining space. The hotel has been in existence for 15 years but only recently received a touch from one of Zambia’s leading painters, David Chibwe who was hired to give the drab wall of the interior a lively touch, and surely the buffets have never been the same again. 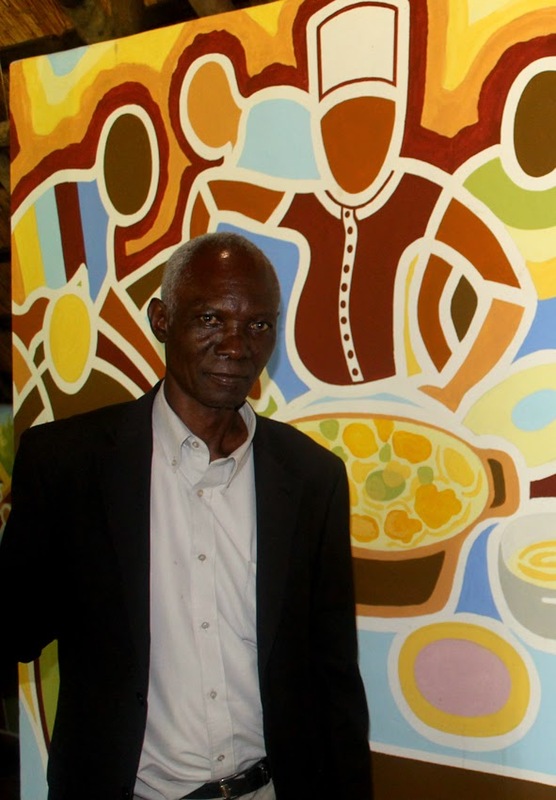 At 66, the Luanshya-born painter and printmaker is classified as a senior artist and a Zambian master who has been active on the Lusaka art scene since he moved to the city in 1970 and later became a prominent member of the now redundant Lusaka Art Society and the Art Centre Foundation. He often boasts of having survived on art alone for over 50 years. 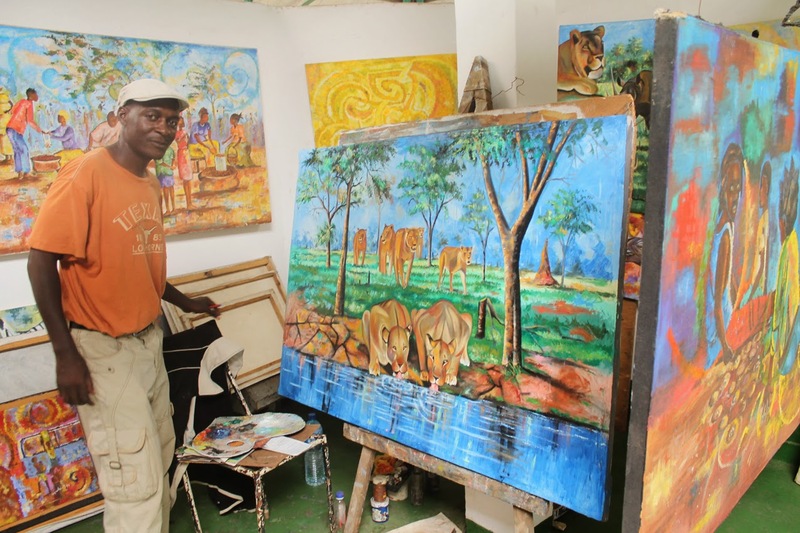 “I worked on the painting for one month and one week and I was working day and night so I was even lodged here at Protea Hotel Safari Lodge, I titled it Together we celebrate, it’s a mixture of several things”, says the artist who was assisted by his apprentice Emmanuel Chibwe, “but I did one in a similar abstract style way back in 1977 at the Long Acres market where we were given a contract at the vegetable market, very white area, but I did that one with two other friends, Patrick Mweemba from Choma and the late Fackson Kulya. 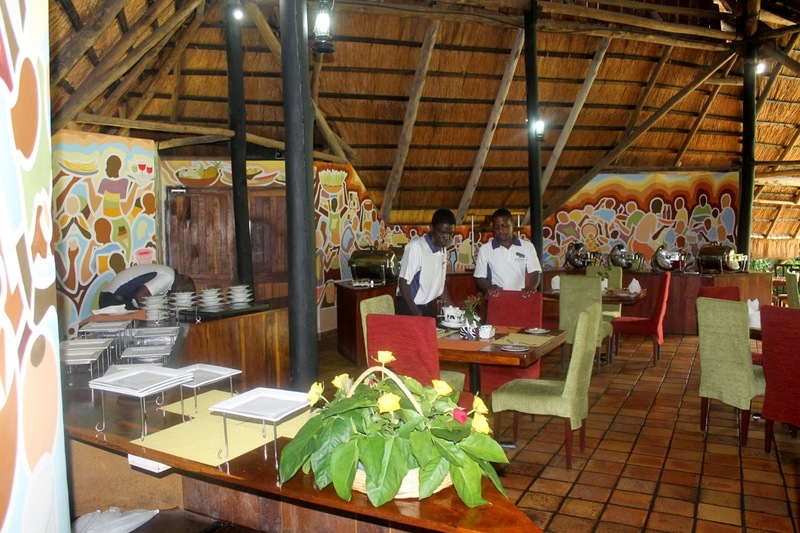 Actually, the Protea Hotel Safari Lodge mural is very different from Chibwe’s usual style which is very pictorial, the images are stylized, a blend of angular and curved outlines that depict musicians, diners at a buffet and so on. In the mural, his use of a whole range of brown and orange, just held together and delicately balanced by threads of blue acknowledge his mastery of colour composition. Nevertheless, dancers, among his favourite subjects do feature prominently in the piece. But besides the abstraction he mentions in the 1977 Long Acres piece, he is also one of Zambia’s prominent printmakers preferring the art of linocut, in fact a set of twelve unframed prints that were just 41.5 x 29cm sold for £1,080 at Bonham’s in London. “I was given a job as an artist by the Cultural Services Department in 1972, by Edwin Manda the actor, he was my boss, a very good man, that time the department used to buy a lot of art, it’s not like nowadays,” he recalls. He says it is Manda that introduced him to the late Henry Tayali, when the latter returned from studies in Germany around the same period, although it is the Choma-based, Dutch artist Bert Witkamp that really made an artistic impact on him in terms of imparting skills and technique. 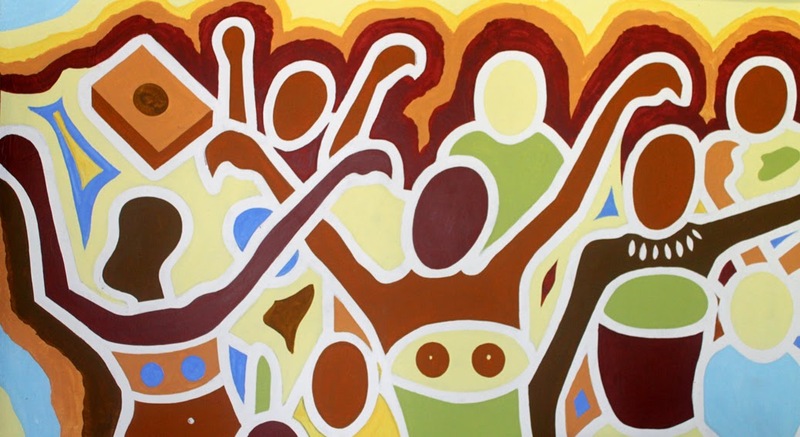 Witkamp arrived in Zambia in the mid-seventies and quickly became popular among the local artists to the extent that he went to live among a group of them in Lusaka’s Mtendere Compound, something which even today would be regarded as radical. “Witkamp taught us how to use linseed oil and pigments, there were no paint tubes for fine art around this time. Even the printmaking, he is the one that would never hide anything from us, he wanted everyone to learn, he is a very good man”, he adds. Witkamp is the brains behind the Graphic Art of Zambia exhibition held at the Choma Museum and Crafts centre during the UNWTO General Assembly that was co-hosted by Zambia and Zimbabwe in 2013. The exhibition featured other prominent printmakers from the Art Centre Foundation days such as Fackson Kulya, Cynthia Zukas and Patrick Mweemba. 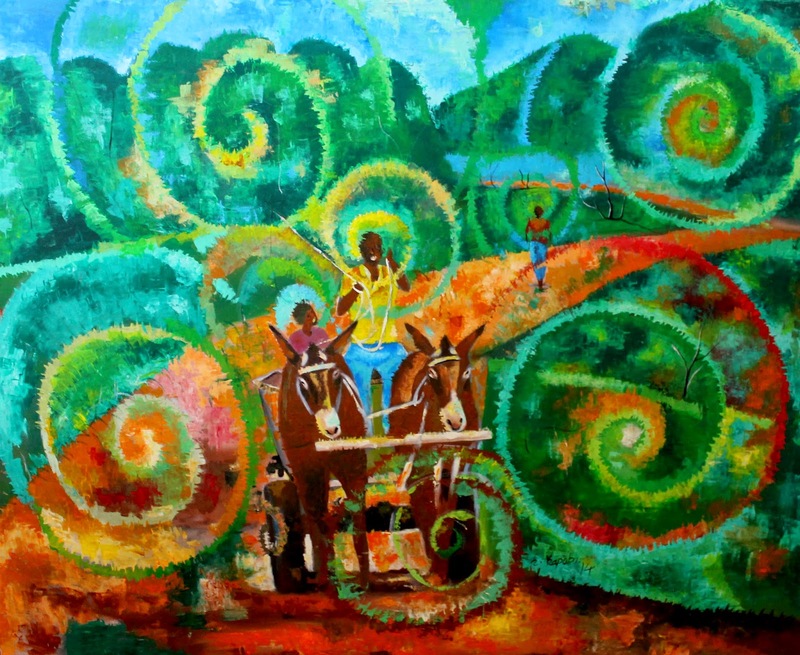 Chibwe remains a key figure in the contemporary art of Zambia not only being a prominent resource person in art workshops, but he has been very active over the years as a reliable tutor in a number of Lusaka’s prominent international schools. He attended the Athens Royal School Likasi in 1964, the Academies of Fine Arts in 1967 and Artistic Humanities Des Beaux Arts, Lubumbashi, Democratic Republic of Congo in 1969. He works from his home in Kaunda Square Stage II but hopes to set up a studio at a small holding in Chongwe just outside Lusaka. Is Edgar for the arts? The more one observes his actions since being voted into office the more one realises that there is probably not too much known about Republican President, Edgar Chagwa Lungu’s personal traits or vision for Zambia. But anyway, this column is a space provided for art. Does he know anything about it? Has he ever drawn a picture, bought a painting, or attended a play at the theatre? Can he tell high art from a curio? Does he have a favourite author, listen to music or know anything of poetry? Is he for the arts at all? Perhaps we have to wait, hope and see. Today he is Zambia’s 6th president after a heavily contested presidential election, yet there is still very little known about what he plans for Zambia beyond his declaration to carry on Sata’s vision. Now, there is no telling still what exactly Sata’s vision was, but somewhere within the subject of his legacy remains the realignment of the Tourism and Arts Ministry as well as the Arts, Culture and Heritage Commission Bill. The enactment of the bill will for the first time see the streamlining or defragmentation of the creative sector, and once it is scrutinized and passed, the Arts, Culture and Heritage Commission will discard the outdated National Arts Council of Zambia Act, 1994, the National Heritage Conservation Commission Act, 1989 the Theatres and Cinematography Exhibition Act, 1929 and the National Museums Act, 1966 and establish laws that will consolidate arts, culture and heritage. The Bill has already been presented to Parliament, however it should be read a few times and if endorsed Zambia will have a whole new structure of governing, and sustaining the arts, a highly anticipated thing among artistes, anxious to become a sector that will even contribute to the nations GDP. Nevertheless, one can only hope that the Lungu administration can bring a lively and renewed sense of purpose and necessity in undertaking the effort to resolve the many challenges affecting Zambia’s creative economy. Of course there is a general concern by artists as stakeholders that they had not been consulted during the formulation of the Bill, still, they should be reminded that the Bill is a set of progressive ideas which will foster wealth creation for creative practitioners across the board; generally making the arts a financially viable occupation. 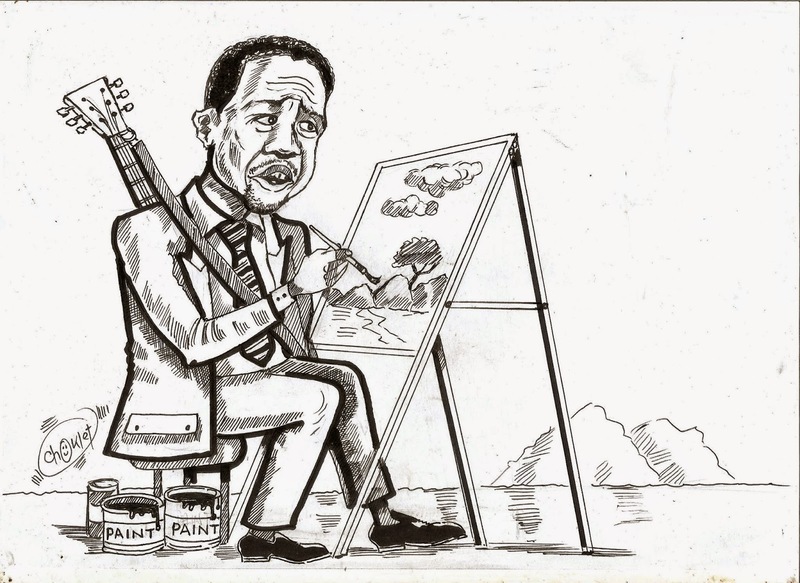 Back to the republican president, re-positioning of the arts remains part of Sata’s legacy, one that he – during campaigns -- has publicly declared allegiance. But we are yet to see whether he is for the arts, there is no telling whether he will ever see it important to visit or open an art exhibition, attend a concert or a play, and above all support the Bill. Nevertheless he should be reminded that if the last presidential elections are anything to go by, he will be needing every vote he can get and most artistes are voters who surely they will be swinging their votes his way if he has a hand in improving their livelihood before next year’s polls. Meanwhile, the statue of liberation hero Harry Mwanga Nkumbula is draped and ready for unveiling at the airport named after him in Livingstone. A milestone, it will be the largest bronze sculpture in Zambia designed and built by a local, Emmanuel Muntanga even though he had to transport it to South Africa for casting because we don’t have the facilities. If Lungu would take a trip to unveil it, it would not only be an entry point for him to show solidarity to arts, culture and heritage, but it would also give him the opportunity to visit the province where he performed the worst during the elections and it will also give him the chance to have his name on a metal plaque just under the statue for all posterity in case he is voted out of office in the next 18 months. 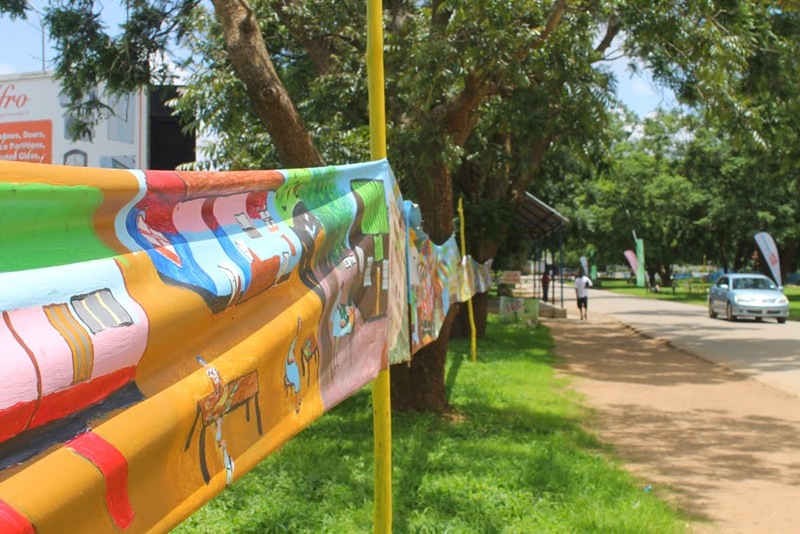 Dubbed Zambia’s longest painting, the Journey in History project a canvas of images that stretches more than K1.5 metres has been on display in the Lusaka showground’s since last week Thursday. Starting from the Great East Road entrance opposite Manda Hill, attached to trees and buildings the painting meanders round several streets, the main arena and finally ends in the Henry Tayali Gallery. 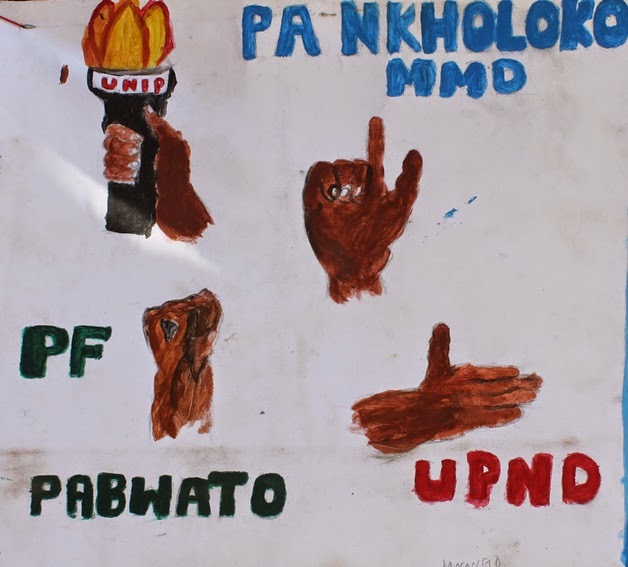 The UNICEF funded project was created by around 2,000 children from all 10 provinces of Zambia for the celebration of the country’s Golden Jubilee as well as the 25th anniversary of the Convention on the Rights of the Child. 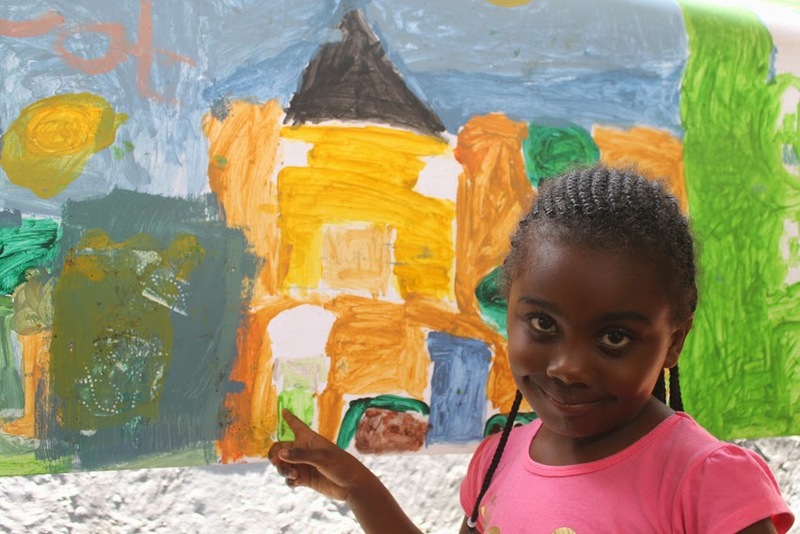 “The more than one kilometre painting reflects the work of children to illustrate Zambia’s history since gaining independence in 1964 and includes paintings on politics, rights issues, sports, farming, environment, and other scenes,” reads a statement from UNICEF. The children were aided by a team from the Visual Arts Council that toured the country and gave guidance with regards themes and technique. 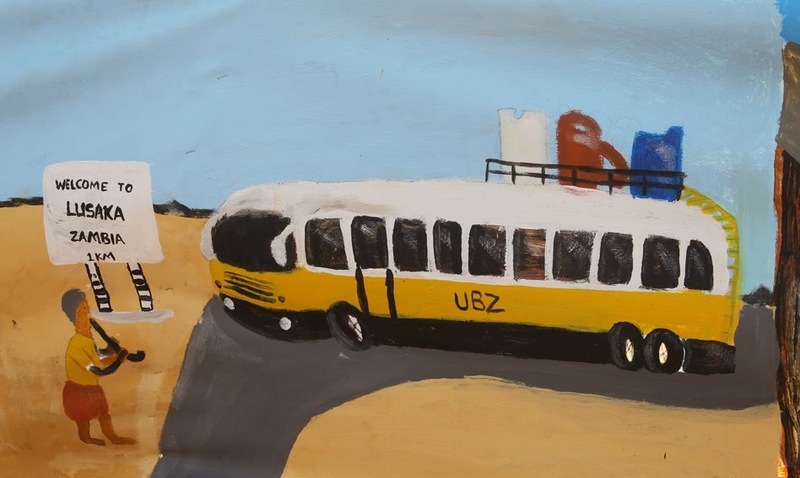 Perhaps the painting may not be a well sequenced portrayal of Zambia’s history as the projects title may suggest, however, it is an exciting insight into the way the children of Zambia are able to perceive, interpret and portray history of their country. The painting evokes forgotten and perhaps forbidden aspects of Zambia’s history like the Mushala rebellion and the so called Lenshina uprising. One may argue that the sheer mention of these Zambian individuals was almost treasonable at one time. The former being the commander of a rebel group active in North Western province and the latter being a Christian labelled a cult leader, believed to be a prophet in the Northern Province. 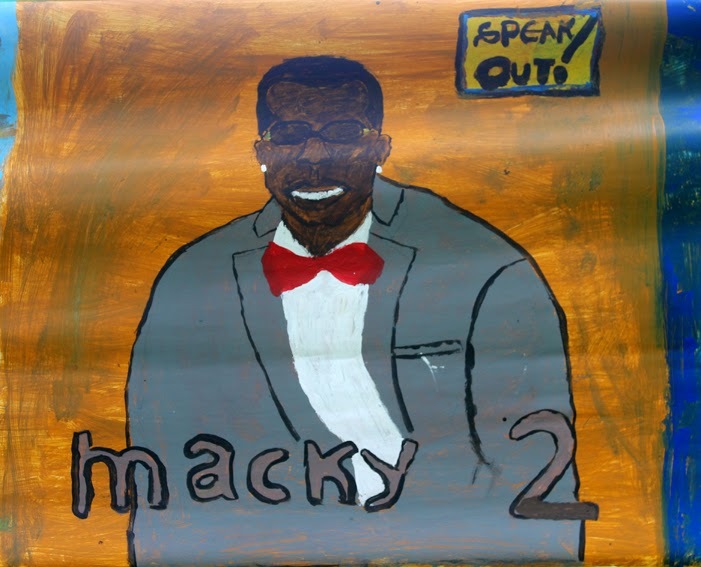 Nevertheless the children have brushed the negativity aside and have innocently made renditions of the two. Such is the innocence of children; in one image a child depicts a bus from the United Bus Company of Zambia (UBZ), but interestingly the bus appears to be a latest model with the distinctive, large side mirrors of either a Scania Marco polo or a Higer bus of course these are the buses that the child knows but in truth, the buses of that era were either the Dubravas imported from the Soviet Union or locally assembled TATA or Renault, the kind that would take up to two days just to journey from Lusaka to Chipata and passengers had to carry pot-loads of food to eat on the way. 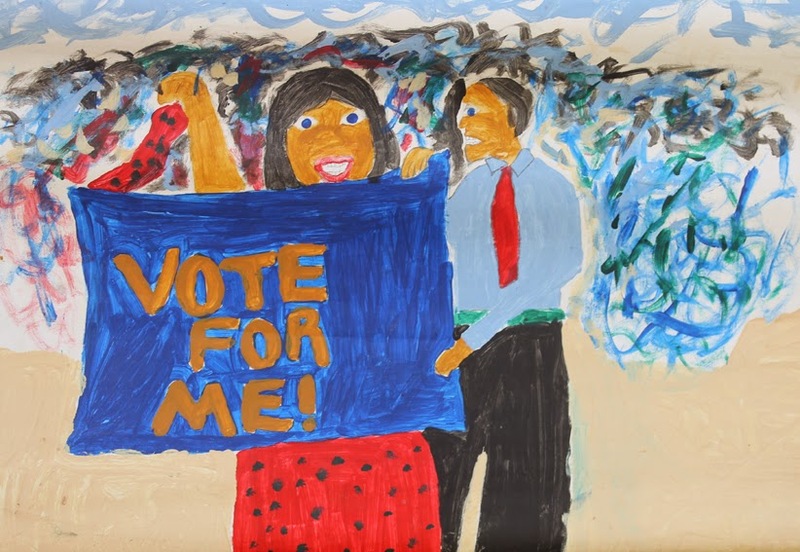 One of the most prominent among the recurring themes is elections, although this year’s polls had been characterised by bitter rivalry, in most of the images that reflect voting, the children appear to register their love for peace and unity depicting rival parties shaking hands, an innocent reminder from the children on the importance of unity at least on their behalf. It may not be easy to measure the success of the Journey in History as a project, but one thing is for sure, the painting is entertaining and throughout the week families, individuals and schools have been trekking to the showgrounds to have a look at the spectacle.